Weezie's Yellow Cottage- 2 chambres plus la maison avec une piscine. Les chambres ont chacune un lit queen. L'espace commun est spacieux avec des plafonds voûtés, un coin salon et une table à manger pouvant accueillir six personnes. La maison est décorée avec goût et meublée avec des meubles en rotin et œuvres d'art originales. Les appareils qui comprennent réfrigérateur, et une cuisinière sont Whirlpool et Frigidaire. La piscine est de 10 x 40 et environ 5 mètres de profondeur avec une grande terrasse. La maison est située dans un quartier calme de l'île sur une voie de sable. Ce est juste une courte distance à pied ou à vélo dans les magasins et restaurants. Les sols sont magnifiquement aménagés et entretenus avec des buissons Coco Plum, les paumes de ventilateur, un grand figuier, paumes palmetto et de nombreuses autres plantes à fleurs. L'océan est trois pâtés de maisons. Il ya un grand porche pour se détendre et laisser filer le jour. La maison est construite en bois dur et a une sensation des Caraïbes. Le cottage jaune fait partie de l'Ocean Front Hotel and Garden Cottages de Weezie. We had a great time at the Yellow House. Everything was great and worked we'll. The manager was really helpful, and we loved the pool and being able to use the dock. The house is in a quiet area, and is about a 15 min walk to the main drag. We rented a golf cart for the week which was a fun way to scoot around. I would highly recommend Weezies for a family trip. Thanks for the wonderful stay. 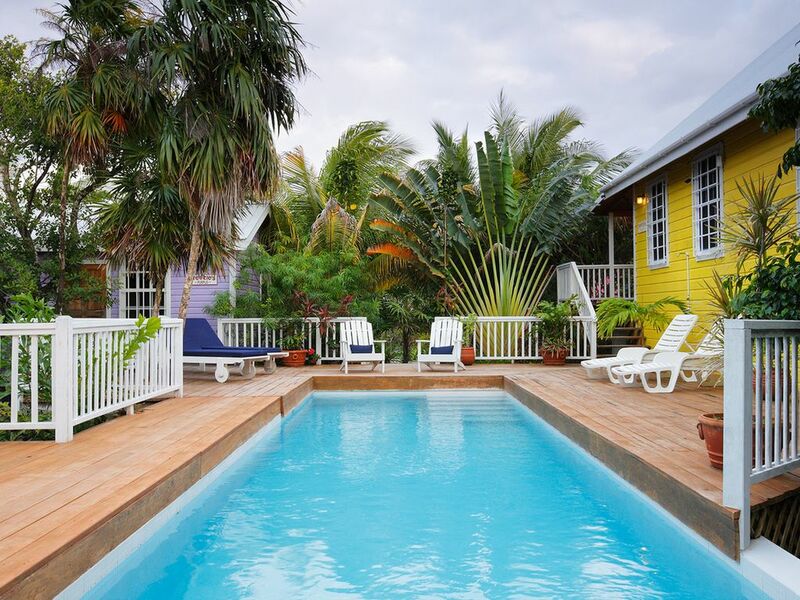 We stayed at the Yellow cottage on Caye Caulker in late March 2018. It was a couple of blocks from the Weezies Hotel area closer to the beach. While not completely ideal, it was a great place to stay. The cottage was cute, like a log cabin with the cool loft up top. No one stayed in the loft area because there were only 3 of us, but it would be a great place for kids to sleep. The kitchen was adequately equipped and serviced out need. This location was a good distance from the city center, so we rented bikes at $5/day which is definitely the way to go. It was really convenient to take the bikes everywhere. We loved our stay and would consider returning if we came back to the island. This is a wonderful cottage on the island of Caye Caulker. The staff was most friendly and helpful and made sure our comfort was their main concern. Kiki and Lionel and many others we cannot remember names of, got us bicycles, gave tour information, set us up with taxi's, etc. The cottage had everything we needed. They provided a local cell phone with the numbers of Max, the taxi driver, and Kiki at the front desk. Very good idea! Max saw to it that we got to a place to eat the first night we arrived and then to the grocery store so we could stock up on some food. We enjoyed sitting on our front porch in the morning, drinking coffee, and watching the kids go to school. The locals are very friendly and oftentimes said hi as we passed them. My only advice to others looking at this cottage - it can sleep 6 people, but there is only 1 bathroom. Could pose some problems for a large group. We had 3 in our group and it worked out fine. I would highly recommend Weezie's as they are on the South side of the island where it is quieter and away from the main street bustle. The town is totally walkable - or bikeable. We loved this island and this house was perfect for our stay. The neighborhood was quiet and the house had everything we needed. Rent a golf cart, eat at Terry's and enjoy this slice of heaven. Our family of 4 (children = boys 8 &9) thoroughly enjoyed our stay here and plan to return! Le deuxième plus grand récif du monde est juste au large des côtes de Caye Caulker. Il offre de fantastiques opportunités pour la plongée en apnée et la plongée. Il ya aussi le kite surf, planche à voile et de pêche. We have bikes for rent for $5 per day or $25 per week No Smoking No Pets upon arrival on Caye Caulker take a golf cart taxi to Weezie's Front Hotel where managers Leo and Kiki will get you checked in. cancelation policy is 30 days. Cancel 30 days prior to arrival receive full refund minus $75. Cancel inside 30 days forfeit all deposits and payments.